Give it your best go at Crested Butte’s annual pond skim on Saturday April 6 sponsored by LandShark! Try your best to keep your tips up so you don’t end up in the icy cold water. Costumes encouraged (read: required)! If you don’t feel up to chancing the infamous pond crossing yourself, then come up and watch the action and soak in all the fun in the sun. The Flauschink Kids Cape Race is NEW this year and will be held on Spruce Carpet at 1 PM. This Free event is open to kids of all ages as well as those young at heart too! Wear your best cape and make your way through a fun obstacle course on the magic carpet near the pond. 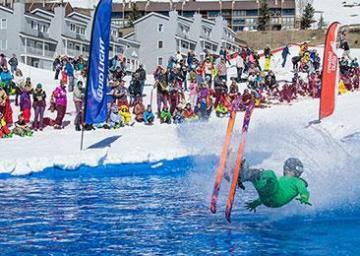 Don’t miss this fun new way to participate for those who are too young to Pond Skim! Parents must be present and sign a waiver. Flauschink celebrates the flushing out of winter and the coming of spring every year over closing weekend in Crested Butte. The 2019 King and Queen of Flauschink will make their Royal Appearance at the start of the Pond Skim. Participants must be ages 13 or older. Any guest under the age of 18 must have a legal guardian present at the time of registration. All participants must be present at registration with a valid ID. Registration is held on a first come, first served basis – once all the spots are filled registration will close. No ski poles will be allowed in the pond. Absolutely no inverted aerials into the pond. Costumes may not be offensive in any manner. Absolutely no alcoholic beverages on course or while waiting to cross the pond. Must compete on skis or snowboards. No other devices will be allowed on course. No teams allowed. Only one person will be allowed to start at a time. CBMR has a right to refuse anyone to participate for safety reasons.